Could Peyton Manning be walking off the field in uniform for the final time this season? According to one report, that possibility could be more real than ever imagined. Will the Broncos’ next loss be the last of Peyton Manning’s career? If Denver wins the Super Bowl, will Manning become the second Broncos QB to walk off into the sunset with a championship? According to a report on Sunday, the answer to each could be yes. Manning, the MVP front-runner who just turned in the most prolific season by a QB in NFL history and whose Broncos are hosting the AFC Championship Game next weekend, will have his future in football very much determined by a medical exam in March, regardless of how this season ends, ESPN has reported. 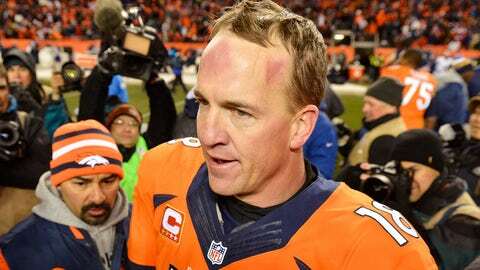 According to the report, Manning will have the exam on his surgically repaired neck per the terms of his contract. If Manning’s neck is stable, it is expected he will return next season, regardless of how the Broncos’ season ends, the report stated, citing sources. If the exam reveals an increased risk for injury, Manning would be forced to consider retirement. Manning, 37, missed the entire 2011 season as he underwent a reported four neck surgeries, including bone fusion. Last season, he led Denver to the No. 1 overall seed in the AFC playoffs before a stunning loss to Baltimore in the divisional round eliminated the team. This season, the four-time NFL MVP set NFL records with 5,477 passing yards and 55 passing touchdowns. The Broncos again earned the No. 1 seed in the AFC, and will host the New England Patriots in next weekend’s AFC Championship Game after beating the San Diego Chargers 24-17 in Sunday’s divisional-round game in Denver. Manning threw for 230 yards, two TDs and an interception in that game. While a 37-year-old with Manning’s injury history weighing his future in the offseason in itself is not major news, the timing of it adds to the noteworthiness as Manning told reporters on Wednesday this postseason carries significance, "Because certainly, the light is at the end of the tunnel for me — no question. And so, I think you enjoy these things maybe even more than maybe you have in the past." Manning is in the second year of a five-year, $96 million contract. Broncos executive vice president of football operations John Elway won Super Bowls in his final two seasons as a player in the NFL, beating the Atlanta Falcons 34-19 and winning MVP honors in Super Bowl XXXIII, the final game of his career.